A family caught out in the dark on the Lake District fells was one of four incidents Keswick Mountain Rescue Team dealt with during a busy Easter weekend. The team was called out about 10.20pm on Saturday when the group called for help from the path between Sty Head and Seathwaite. A team spokesperson said: “This tasking originally went to Wasdale MRT, but was passed to Keswick after it became clear that it was in our area. Six Keswick MRT volunteers took part in the two-hour rescue. Earlier in the day, the team was called out after a 24-year-old man was blown by a sudden gust into a gully while walking on Base Brown. He suffered ankle and wrist injuries in the fall. The team spokesperson said: “The team immediately dispatched a lead Land Rover, and three local team members in the Rosthwaite area deployed direct to Seathwaite farm. “A second vehicle brought further team members to assist. The casualty was located about 100m above the path that runs through Gillercombe. The North West Air Ambulance, which was just finishing a job in the South of the county, offered to assist and, despite gusty winds, managed to land some distance away on the ground towards Honister. The incident involved 16 team members and lasted almost 2½ hours. While Keswick MRT was on the hill dealing with the injured walker, it was alerted to an incident on Derwent Water. 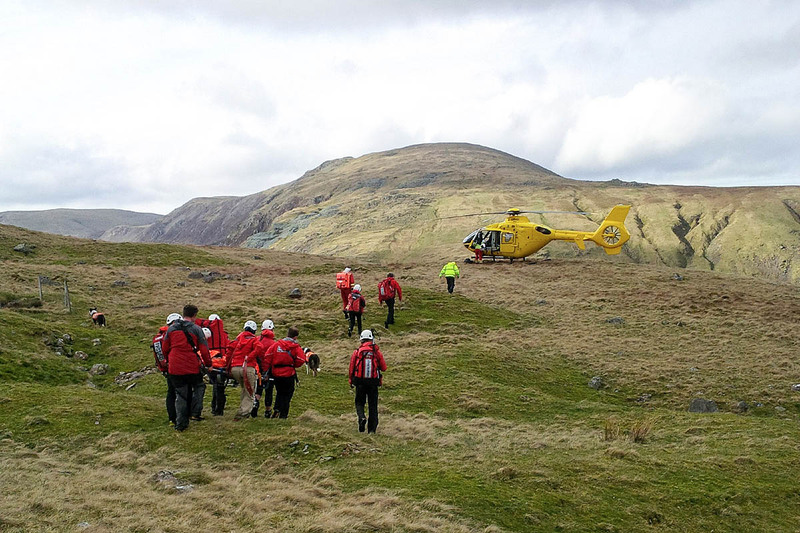 The Keswick team was in action again on Easter Sunday when a woman slipped and broke her ankle while walking with her partner in Fairy Glen near Stonethwaite. The team spokesperson said: “The team set off to Stonethwaite with two vehicles full of personnel, and a local team member went direct to the scene. The 1½-hour incident involved 14 team volunteers.